This interlocking set of high density EVA foam squares is great for your home gym. Each set includes 12 interlocking squares at 24" x 24" each. This will cover 48 square feet of surface area. At 1/2" thick, they'll provide a strong surface for your workouts that provides plenty of grip, and provides a high density layer of protection for your valuable floor. Additionally, these squares are easy to configure exactly how you want them. Whether you need a completely square layout, or more of a rectangular approach, you can piece them together in any way you wish. They're also lightweight and easy to move as needed. Lightweight and easy to move. Each tile weighs just under 2 pounds. These interlocking pieces are quick and easy to assemble so you can set it up and take it apart easily. Great for garages and basements and even on the carpet to protect floors, reduce noise, and make floor exercises more comfortable. The dense, textured foam offers the perfect base for weight lifting benches, dumbbells, kettlebells, and other workout equipment. The Exercise Puzzle Mat is perfect for working out in areas with hard floors, such as garages, basements, and CrossFit boxes. 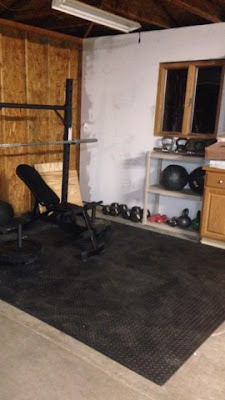 If you need a safe and comfortable area to workout, but don’t want to completely redesign or install flooring at home or in your fitness studio, this is a great option. The dense foam provides more room and cushion than yoga mats or folding exercise mats, allowing you to spread out with weights or a bench and perform a variety of workouts. The ½-inch thick flooring protects floors from stationary bikes, weights, equipment, sweat and even my large Yoke Squat rack (weighing close to 400lbs when fully loaded with storage pegs). The water-resistant material makes these mats super easy to clean and maintain. The textured, non-skid surface improves grip and prevents slipping during workouts for and a safer workout. High-density foam provides a comfortable cushion for knees, back, wrists, and elbows. Great for floor exercises like push-ups, sit-ups, setting a bench on for bench presses or foam rolling and stretching. It can even be used for yoga or Pilates. It’s built to last for long-term, dependable use. The 12 square tiles cover a total of 48 square feet and include borders for a polished, finished look. Use fewer if needed, or buy more to cover a greater surface area. The interlocking tiles are easy to assemble and can be removed just as easily when needed so you can maintain a versatile space. They are very easy to cut for customized projects. Each band increases in resistance as it is stretched, and imparts constant tension on the muscle, something which dummbells cannot do. Combine the bands to increase the resistance for your exercise. Resistance Bands are the premier fitness product for strength training and resistance training programs. Perfect for fitness enthusiasts, cross fit athletes, and anyone just looking to get into shape; the Active Living resistance bands will have you getting in better shape without the need for a gym membership. With resistance bands your body will tell you exactly how much resistance you can safely handle, because - unlike traditional weights - the resistance of our exercise bands increases with extension! That means that the resistance you feel will increase gradually as you pull more. Pull less: little resistance. Pull far: more resistance. You can feel exactly how much strain you put on your muscles, and workout safely. With this Active Living resistance bands package, you can now workout on your own terms where ever you want whenever you choose. The two way resistance allows you to benefit twice from a single motion compared to the single upward motion you do with the traditional weights. Resistance bands allows you to get fit, lose weight, gain muscle, get stronger and achieve your fitness goals. Personally, I use these bands as a warm up before most workouts and before all upper body movements. It feels good to prep the shoulders and doing unilateral movements allows you to work on left and right muscle imbalances. With my training area, where I work with some local clients and ball players I have multiple carbiners attached to the wall at different heights, which allows me to adjust the angle of the resistance band by simply unhooking it from one clip and attaching it to another. In terms of durability they are just your standard bands, not like Crossover Symmetry quality, however no where near the price either. It would be beneficial to have 2 sets of these bands attached to a wall, fence or post, then you would be able to mimic many of the Crossover Symmetry movements for a fraction of the cost! If 30 days have passed, we'll gladly accept your return as well by providing you an in-store credit for the original value of your item. First the interlocking foam gym mats are not commercial or industrial rubber mats, so don't expect them to be when you get them. They are pretty much like the ones you can buy in the stores which are the soft foam rubber kind like these, but from a much better brand. They are priced as expected (on sale now for $80), and actually cheaper than similar mats which is expected being an Active Living Product! They are kinda on the thin-side to me at 1/2" thickness as I would prefer something closer to 3/4". But, they are thick enough to make a big difference when you exercise. Placing equipment on these are fine, but they will sink into the foam, so expect that. The foam does go back to normal over-time if you move equipment and leave an indentation. Aside from those critiques, I believe these mats are the best option for most home gyms, in terms of value, benefits, cushion, convenience and coverage! The band set comes with 5 different resistances to challenge you as you progress in shoulder/scapular strength. Great for a warm up or full workout. Like I mentioned above the durability is no where near some of the more expensive brands however with 2 sets you can mimic all the movements (unilateral and bilateral) but more importantly with much better value! More importantly you know you are in good hands working with the Cody, and the Active Living brand. Great people, no risk guarantees and policies, and some of the best products for the VALUE! Click on the links above to purchase your own products listed in this review or visit activeliving.store to view everything they have to offer! Use promo code "TRAVIS10" for 10% off your purchase!